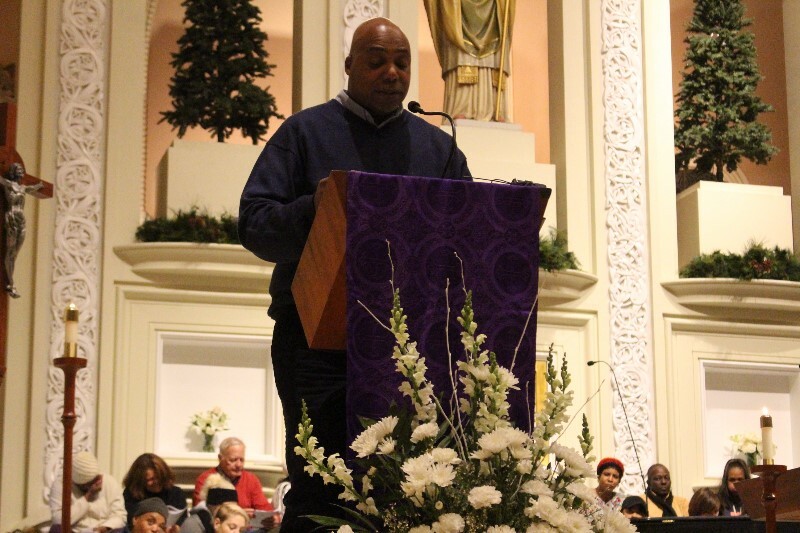 Twenty-six Chicagoans who died in 2016 were remembered at a Homeless Memorial service at Old St. Pat’s Church. Harmony, Hope & Healing sings at the Dec. 19 memorial service. The annual service was first organized in 2010 by the Chicago Coalition for the Homeless, Ignation Spirituality Project, and Old St. Pat’s Church, 700 W. Adams. It features a pre-service dinner for homeless families and adults, this year serving 50 people from Breakthrough Urban Ministries and Madonna House. 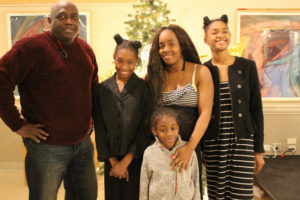 Dominique Moore, a mother of two, said her family has coped with homelessness for a year. “I like coming to these events. It’s very touching,” said Kellia Phillips, a mother of three who volunteered with CCH’s fall voter registration drive. Another attendee, Phillip Miller, received help at Matthew House and Olive Branch Mission after he was paroled three years ago. He was invited to the memorial by CCH organizer Keith Freeman. Rev. Robyn Tabb and Rev. Marcus Tabb of Neighborhood United Methodist Church presided over the hour-long service, which drew some 200 participants. Speakers included Brooklyn Priestley, an older youth, who was homeless when he moved here from Dallas two winters ago. He slept on trains before finding shelter and services from La Casa Norte and The Night Ministry. “Today I’m no longer homeless. I have a place and I’m back in school,” he said, to applause. Wayne Richard, CCH’s associate organizing director, read a poem he wrote. His organizing work includes directing Horizons, a writing outreach program in Chicago shelters. 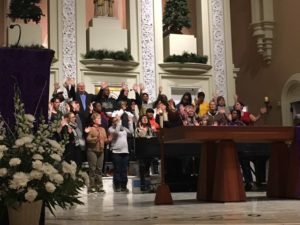 Five other service organizations co-hosted this year’s Homeless Memorial: Cornerstone Community Church, Harmony, Hope and Healing Choir, Heartland Health Outreach, New Moms, and The Night Ministry. The Chicago service is affiliated with National Homeless Persons’ Memorial Day, one of more than 150 events across the U.S. organized by the National Coalition for the Homeless.